Conductive nylon, a new development in the brush industry, is a non-marking synthetic brush fiber that can take the static charge created by the brushing action and send it to the ground where it belongs. Loose particles are free to be vacuumed away and brush action is free of residues that typically clog and restrict bristle action. 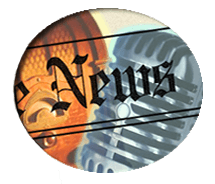 It is available in a variety of sizes that are not available in natural fibers, it has better wear characteristics, and it is priced competitively. Do you have a static problem that is frustrating you? Are natural fibers doing a good enough job or is it time to reevaluate your application and see if Conductive nylon is right for your application? We encourage you to contact us for further information and to discuss your specific application. This could be a real breakthrough in dealing with one of your chronic problems, Static. Doctor Roll Dampening has become a highly sophisticated method of applying moisture to a web traveling at extremely high speed. The system is used in the manufacture of paper and is an integral part of most offset printing systems. The same brush and pick-up roll configuration is also used to dispense adhesives, waxes, and powders. Normally, the pick-up roll which is usually rubber covered, and the cylinder brush are both variably speed driven. This feature ensures absolute control of moisture content applied to a traveling web. The pick-up roll runs at a comparatively low speed (30 to 100 rpm) while the cylinder brush rotates at a much higher speed (800 to 1200 rpm). 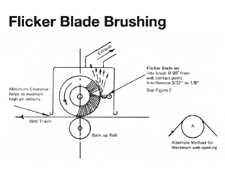 Flicker Blade Dampening is a relatively simple method of applying maximum moisture to a slow moving web. The system requires a holding pan, power driven brush, and stationary doctor blade assembly. It can also be used to disperse adhesives, waxes and powders. 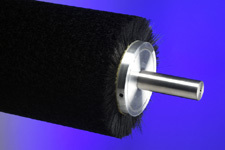 Rotary cylinder brushes have been used for years to remove lint, excess flock, or any other undesirable particle or substance from a moving web. A power driven brush, by virtue of the fact that it is an endless revolving cylinder, tends to carry or load some of the brushed particles into itself, rather than releasing all of them each revolution. The cylinder brush then becomes loaded or as contaminated as the web it is brushing, and tends to re-deposit the particles back on to the web.